Gor Mahia’s endurance and fitness will be tested to the limit in August. The club is set to play 10 matches between August 1 and August 29. This includes key matches such as the CAF Confederations cup group stage matches against USM Alger and Rayon Sports, as well as the return leg of the mashemeji derby. Coach Dylan Kerr described his approach to the marathon schedule. Playing a match every three days will test Gor Mahia to the limit and avoiding injuries will be a tall order. But coach Kerr is positive. 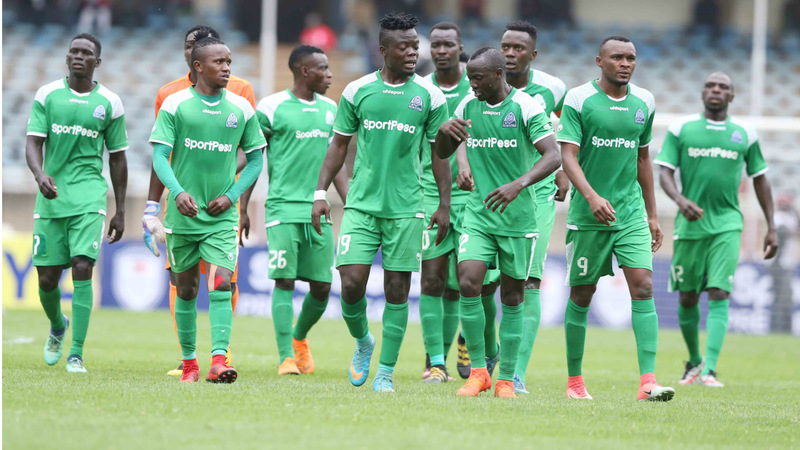 Gor Mahia v K. Sharks – Kisumu (August 1), Nakumatt v Gor Mahia – Machakos (August 4), Bandari v Gor Mahia – Mombasa (August 7), Posta Rangers v Gor Mahia – Narok (August 10), Gor Mahia v Kakamega Homeboyz – Machakos (August 13), Gor Mahia v Chemelil – Machakos (August 16), Gor Mahia v Rayon – Kasarani (August 19), Sofapaka v Gor Mahia – Narok (August 22), Gor Mahia v Leopards – Kasarani (August 25) and USM Alger v Gor Mahia – Algeria (August 29). What about Gor MAHIA vs Everton?Has it been totally scrapped? As long as Boni is not in goal you should be good to go. Please use the other two goal keepers forget about Boni who has the I don’t care attitude. The pain Boni caused me over the weekend is unforgivable. I felt like destroying my TV. @Jabatiso, please stop being too personal and I hope Bonny has learnt from this school kid mistake. The bottom-line is that Gor Mahia won squarely. I am very concerned about these fixtures. Someone at KPL wants Gor Mahia not to win the title. Gor Mahia is representing the country in CAF Cup and in Africa. This is being too unfair to players as players are not robots. The players are human being that need rest for full recovery of the next matches. I am very concerned and disappointed about these congested KPL fixtures. I think someone at KPL wants Gor Mahia not to win the KPL log title. Gor Mahia is representing Kenya in CAF Cup and Africa. This is being too unfair to players as players are not robots but human beings that need total rest for full body recovery for the next matches. Make use of the reserve bench. Relegate Bonny permanently to the bench. I deliberately kept off the Bonny issue to avoid being swallowed by the heated vitroil that was at play immediately after the game bcoz it is at those heated moments that any view that is not in lock and step with the emotions at that moment is taken as being supportive of the person being lynched . It is a fact that the law of diminishing returns has set in on Bonny and for a lot of reasons , the major one being indiscipline and impunity , the result of the above being casualness and an I dont care attitude , the casualty of all this being the team , the club and the fans . Put in context , the casualness of Bonny may have cost the team a cool ksh 35million if not for the industry of the rest of the team . Be that as it may , something @Musyno said got lost in the midst of that lynching and for which I concurred with , and that is , that as much as those blunders occured , is Odhonji ready for this stage ? , an example comes to mind , David Degea made some very critical mistakes during the world cup and Spain had a second goalkeeper , but if we were to go the lynching route , would it then mean that he be benched and his understudy take over ? , why didnt that happen ? . I have witnessed this must go chorus in Harambee stars and in Afc and after the must go chorus has succeeded , what they eventually get is a stanley okumbi and Koops and then predictably the must go chorus resumes and at a higher decibel . Bonny as has been prooved by his dropping by harambee stars is a guy who going fwd is not somebody we can bank on , but in the short run Shaban may not be the answer , while I dont know Odhiambo’s current form but I trust in the coach to know better . Liverpool’ s Mignolet must go crowd got their wish when he was benched and then they got Loris Karius and those who watched the champions league final may have seen the consequencesof the must go crowd . @ Teddy Sofaset branch. Indeed you should consider being a mediator and peace keeper when you grow (I hope you are young enough to grow). Good piece by you up there. Goal keepers will make normal mistakes and those will be forgiven. It all depends with what is at stake. Alot is at stake for Gor mahia right now. With this congested fixtures and feasible a overworked team, this is the time Gor should be winning the mourinho style of margin 1 nil. This cannot happen when you conceede stupid, useless, uncalled for goals. When Gor conceedes a goal this whole team becomes under pressure and chances of conceeding another becomes eminent. It has reached a time when if gor conceedes a free kick with Bonnie in goal then i begin to scratch my buttocks because there is 80% chance it will be a goal. That being said, certain mistakes in the goal keeping area are not forgivable and me and like minded fans here will not forgive Boni. it doesnt matter who comes in to replace Boni. nor does it matter whether the person performs worse than Boni. We will cross the bridge when we get there. So many things have caught up with Bonni including age. Am yet to see Boni dive like a monkey in front of goal. Now back to your analogy and example of Karius at liverpool. The mistake Karius did at liverpool in the champions league game was so grave that I personaly would not forgive him. Fact. his coach did not forgive him either nor the fans. As we speak, karius has already been replaced with Allison. It doesnt matter how much karius sobbed and cried. After the champions league game even his own players ran a way from him and none even consoled him. He was left to cry and carry his own cross. Only the animal Sergio Ramos-his opponent went to console him. Karius went around the field on that day asking for forgiveness from the fans with tears rolling down his cheeks. Was he forgiven? No. He now has to sort his future but i gues not at Liverpool. Did Bonnie even acknowledge he did a mistake? Did he even behave as if he did a mistake let alone asking for forgiveness, No. Anoither fact. Because of the two stupid goals Bonnie conceeded at Yanga, we are now tied with points, goal difference with USM. Those goals he conceeded may be the goals that make gor be number two in the group and hence face anumber one tougher opponent in the other group. Nooo Noooo noooo Bonnie MUST GO. I am ok with playing all those matches in 29 days save for the Efusi tie. Considering Efusi players’ roughhouse and gangster mentality whenever they play against us, our players’ safety will not be guaranteed, with only 3 days before we meet USMA away. The actions of Abdalla Salim Shitu and Said Tsuma must still be fresh in our memories. We all know why and how Jausenge had to be rushed to the ambulance. I don’t think we should expose our players to such eminent life and career-threatening danger. I believe there’s still time for our EC to ask for postponement of the derby to first weekend of September. It’s a pity how Afc Leopard and the club in general plays the jilted lover role when it comes to Gor Mahia. This club struggles to beat Mwatate, is thrashed by Homeboyz but wants to convince everyone it can beat Gor. People like Abdalla know very well that they are not footballers, they depend on raw power and roughhousing. The sad part is that this has been a technic encouraged by local coaches like Matano… even Kimanzi has used such technics. When Matano was a defender at Kenya Breweries, they were known to have one of the roughest defences in the then KFL. Ulinzi again under Matano was known for such technics. The long run is that it ended up destroying the Kenya game. Have you ever wondered why most Kenyan coaches are defenders or goalkeepers. Kenyan soccer silently dictates clubs be captained by a defender. Problem, 30 years later countries known only for Cricket like India can now beat us. How this defender theory helped Kenya I do not know. Kenya soccer became defence minded. Strikers fear to venture and have basically became bankrupt in ideas. Gor Mahia is one club that has used this tradition for long. Many will want to argue that Gor has succeeded but this I only agree if you talk about the EA pond. Gor Mahia has alot of work to do if it has to capture the African immagination. I believe that the current coach is up to task. Packing-the-bus is the most preferred modus operandi for Kenyan coaches apart from the second most preffered method of time wasting. Most foreign coaches have lamented against these wayward approaches to football. In Kenya you can be a stop striker with 4 goals. AFC leopards must learn that you cannot make yourself relevant simply by looking at what Gor is doing. It really disappointed to see Afc insist that they be included for a qualifier for the Everton trip. They have taken the wrong approach… this means that Zapata has taken the local approach rather than come up with his own ideas. Logarusic might not have been the greatest coach ever but one thing he did big in Gor was to remove the club from this type of “colonial” thinking and into modernity. It’s a really tight fixture since the league must end on the 7th of October. We will weather the storm. This is the time for Cersidy, Onguso et al to shine. @ Dan Original How Now? Where Did You Get This Arithmetic? Teddy, well said, but we don’t want to be crying coz of school boy mistakes, and maybe he has some other issues. Remember who slaped Prof Nuttal? Bring Them On! The SGR will flatten them out bila huruma. Sisi hatuogopi fixtures. Hello my in-laws…Did you see the beautiful lady in the gallery.Any one with her contacts?The queen of my house-mama Travis-has permitted me to bring her a co..you know.The rider is she must be from the lake side.Ja asego,BB,Musymo,ja Migori n.a. wengineo si mnifanyie U?henga? Hehehe Baba Travis what are you up to? Tosheka na huyo uliyenaye. Somewhere in the book of James, The Holy Bible says that “flee from the devil and he will flee from you” Remember what Jesus told the devil? “Away from me Satan”! My brother, just stand up to satan and tell him the same, in Jesus’ name. Apostle Mwakio should itemize this prayer need as urgent. Baba Travis my first reply to your request has been quarantined. In the meantime I want to remind you of the cereal, green grams. They may all be green and appear ready to boil for food, but then some will never soften however long one may patiently do the boiling, hence the saying “Tama kaka olayo”. Unboilable hence not edible. Just thank God for the daughter of the lake that you have with you. @Baba Travis, I can help you get her as long as there will be no problem in your house. My people boys will always be boys. Kindly let Baba Travis make merry. His heart has melted. And now that you quote the Holy Book, it has several instances where God assigned very important duties to polygamists….there has to be a good reason for that. But first @Baba Travis old timers like us may remember a movie called How to be a Player…watch and take notes before you embark on this rollercoaster !!! Heheeeeee…BB my in law.You are against my progress yawa.Ever considered being a pastor?What a lecture! We once had a super wonder boy keeper called Dan Odhiambo. He started letting in silly goals and alash only for us to realize he was medically myopic….opponents took advantage of that to score goals. Is Boni suffering from the same? Jasego? Some comments are absolutely irrelevant on this Gor mahia page. Why not use fb messenger to inquire about women and reserve this kogalo page for mature growth oriented football matters. Odhis Muga my namesake, why are you being so uptight? Am sure Baba Travis was just having a light moment…even the replies are mostly humorous. And even if he was serious this is social media and anything goes….with all due respect just post your ideas,let’s argue but dont try to limit what can be said or not because you will have very little success. It has been proven that such gagging never works on this site. For your peace of mind and others of like mind, kindly create another blog, give your ground rules and only admit people who sign assurances that they will only post what you approve!!! Out of these ten matches in the month of August eight are KPL fixtures and out of these we need to win seven, hit 73 points and we are 2018 champions designate. This position is based on the assumption that should Sofapaka win all her remaining matches then the highest she can amass is 70 points whereas Ogwang’ and Bandari can amass only a maximum of 69 points. However, football being spherical, this league may even be won by K’Ogalo in the next 5 games , i.e. within this month of August. My point is FKF could be in a position to send the name of Kenya’s representative in the 2019 CAF competition by September. BfB Sofapaka is a “she”? Hahahaha…BabaTravis, follow your heart, wachana na Odhis, maybe he is on the same trail … heheeeee. I like this. tight fixtures?…i thought July was worse with cecafa…they pulled through v. well. its a baptism by fire and kogallo is maturing for the next level. God has been faithful and will help them. lets remain positive. thank God we have forgiven Boni. when is kogalo day to celebrate 50th anniversary? Dear My Beloved Coach, Kerr, i know you are going to motivate the team as always. Leo nita celebrate with sparkling wine if Gor beats Sharks . Hii team ya Mr. Mwendwa said that they can not do business with Gor Mahia – they could not release Ovella Ochieng to join our team. If we can beat them and i know we are able , i would be very, very grateful. Good luck KOgalo. Looking at that August fixtures, honestly speaking it looks tough. This is the time to live out the true meaning of supporting the Team through thick and thin. Kogalo is the greatest enemy of all the teams. They are all preparing with Gor in mind. Any other team’s greatest achievement this year is not to win the league but to break the unbeaten record. For them therefore they will do everything possible to do just that. Now, supposing that happens how will you react as a sworn fan to of the team? Are you going to be overcome by the pain of that happening or you will you still stand firm and sing to the top your voice in support of the Team through thick and thin? I would however add in very quickly that I am not wishing that it would happen. But to be fair, August looks tough. To the Team, we will keep cheering on because there are are very many positive things happening to all the players. 1. Everyone is getting an opportunity to play and showcase what they are made of. 2. The mental ability is getting stronger, which is needed as we recently saw in the just concluded World Cup. 3. Endurance is not left behind either. This is good for muscles development. 4. You are discovering how to win games and not just running with the ball for 90 minutes. 5. Many teams are wondering what it is that you are doing right that they do not do. Finally we pray you every day, that God may protect your families, as you play and also as you travel. They say laughter is medicine to the heart.It makes you feel younger but wiser.I noticed the frown on many a faces here because of Bonny’s howlers in DAR.We even stopped to celebrate the big win and instead zeroed in on that small matter.Ask EFUSI fans and you will realize it is time to rejoice.We waited for years for moments like these.Let us learn to forgive and move on my in laws.Times of success,like these,are always short-lived.Why spend time arguing over trivialities?Am happily married. Just wanted us to deflate a little then talk again. @jasego,Musymo,BB plus every one who offered assist I say thanks. Boniface Oluoch has been dropped from Gor Mahia squad set to take on Kariobangi Sharks in a midweek Kenyan Premier League match. Oluoch has been under pressure after committing two costly blunders in K’Ogalo’s 3-2 victory in the Caf Confederation match against Yanga on Sunday. Coach Dylan Kerr rested his first choice custodian, alongside club’s top scorer Jacques Tuyisenge for the tie set to be staged in Kisumu. Also missing from the Matchday squad are George Odhiambo as well as Ernest Wendo, who was expected to make his return from an injury picked during the Cecafa Kagame Cup in Tanzania. In the absence of Oluoch, Shaban Odhoji will man the post and will be shielded by Innocent Wafula, Geoffrey Walusimbi, Haron Shakava and Charles Momanyi in the defence. Ephraim Guikan will lead the attack with support from Francis Kahata and Bernard Ondieki. Gor Mahia starting XI: Shaban Odhoji, Innocent Wafula, Godfrey Walusimbi, Haron Shakava, Charles Momanyi, Boniface Omondi, Cercidy Okeyo, Lawrence Juma, Ephraim Guka, Bernard Ondieki, Francis Kahata. Reserves: Fredrick Odhiambo, Raphael Asudi, Wesley Onguso, Joash Onyango, Wellingtone Ochieng, Samuel Onyango, Kevin Omondi. 33rd minute, Gor Mahia 1 – 0. Friends let us continue praying for God’s favour in this match. Halftime. Score stays 1 – 0. Capital G of Kisumu, please give us some details on the developments in the lakeside. Friends, pray. 73rd minute, still 1 – 0. Halleluyah! Glory be to The Almighty God. Full time Gor Mahia 3 – 0.
Who are the goal scorers? One Jiwe walilokata washi deride by some as K14 he is returning faith the coach has in him and Ljuma . Amen and God is great. The stone that was rejected by the builders, became the corner stone. K14 is getting back to his former self. I said and I repeat, Ade is going to be a very dependable player in the remaining fixtures, then watch him next season. Form is temporary class is permanent. Very few player in Kenya today match his class. Otherwise, congrats for beating kale ka team ka chairman. Why can’t Oguda and Mwendwa postpone some of the league games so that the boys can get good rest between games yawa. Going forward and in appreciation of the congestion we face , its my humble plea that the team that played today be given more and more play time in the local league with the more established players being injected occasionally just but to maintain the fitness levels . Finally I join the rest of the Kogalo family in congratulatingthe boys for yet another good job done , I sometimes wonder how it feels like to be an ingwe fan with their stuttering performances , clueless and rudderless Ec ,how does It feel watching from the den and seeing how their hitherto peers are tearing all and sundry , clearing and sweeping all that dare cross their path , spending as much time in the air as they do on the ground , from one capital to another , It surely is a good time to be a Kogalo family member , It has always been .